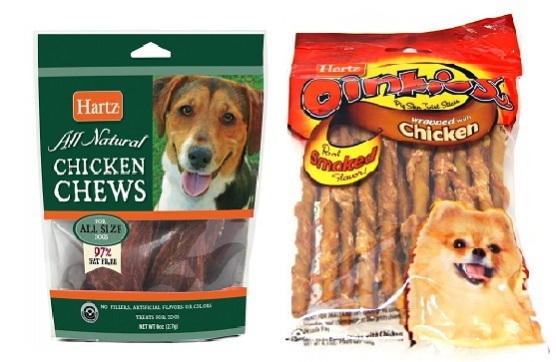 The Hartz Mountain Corporation, makers of Hartz Chicken Chews and Hartz Oinkies® Pig Skin Twists (pig skins wrapped in chicken) dog treats, pulled those products off store shelves yesterday in response to the company's own findings of contamination in the products. These two chicken products, like many other chicken treats made in China, were found to contain residue of unapproved antibiotics in them. Instead of facing a recall on the Chicken Chews and Oinkies, Hartz decided to simply withdraw them from the market once it found the trace elements of the antibiotics. Hartz reported the findings to the FDA. “Upon learning about the nationwide voluntary withdrawal of several other brands of chicken jerky products through media reports, Hartz acted immediately to begin additional testing to determine if the same unapproved antibiotic residues were present in our products,” said Sean McNear, Sr. Director of Quality and Regulatory at Hartz Mountain.